FAST exceeded my expectations in every way. As a result of my participation in the FAST Program, I easily acquired employment at the Aquatic Centre. I thoroughly enjoy my hours at the pool, both as a game leader, and as a volunteer teaching swim lessons. I have met a number of people who I now count as my best friends. The FAST Program helped me achieve my goal of getting a job in aquatics. Everything you learn in this program is more detailed than the lifeguarding/first aid courses you can take elsewhere. It was a great experience that I would do all over again! The FAST program gave me skills and confidence around the aquatic environment. This has led me to move forward in pursuing my goal of being a swim instructor. I gained many friendships throughout the year, and that made it a very enjoyable course. I highly recommend it to anyone who enjoys swimming and wants to learn first aid. You also get 10 credits, so that's a bonus! FAST has given me the opportunity to give back to my community and be prepared for emergency situations; also it has given me an amazing opportunity, to be able to work as a game leader at the West Vancouver Aquatic Centre. I believe without taking FAST this would not have been possible. I hope that anyone considering whether to join the FAST program makes the right decision and applies! FAST is by far the most practical and enjoyable way to complete your Bronze Medallion, Bronze Cross and Standard First Aid. Dave and Karley create an uplifting, fun and educational atmosphere where you can fully understand the lifesaving skills taught. I highly recommend the course and I am so grateful I did it. The FAST program made learning first aid and swimming very enjoyable. The mix of activities including field trips made the program interesting as well. I encourage anyone interested, to apply for FAST. You will gain tons of experience for becoming a lifeguard. The FAST program helped me so much in attaining a position with the West Van Aquatic Centre. After spending a year being around the pool and meeting people who worked there, I found the hiring process to be very smooth. For my scholarship applications this year, I am using the FAST program as one of the main points since it really developed my leadership. By becoming certified in Standard First Aid, CPR-C and AED, I felt that it really developed my leadership as I became more aware of the community’s wellbeing and prevention of injuries. It really opened doors for lifesaving and lifeguarding, as well as for aquatics in general. The FAST program was a great addition to my school year. It provided me with many hours of first aid skill practice and certification in Bronze Medallion, Bronze Cross and Standard First Aid. I very much recommend the program to anyone who loves to swim or wants a job at the Aquatic Center. Applications for the FAST program for the 2019-2020 School Year are now closed. Please contact Dave Dickinson if you have any questions or would like to be placed on the waitlist. FAST is a young lifeguard education program that will allow students to develop the essential skills to be successful and confident lifeguards. At the completion of the FAST program students will have obtained all of the required certification prerequisites necessary to enroll in the National Lifeguard Course, which students can take independently when they are 16 years of age or older. Completion of the National Lifeguard Course is the final credential necessary to qualify an individual to work as a lifeguard. In addition to developing strong first aid skills, the FAST program also focuses on providing students with a practical foundation in resistance and cardiovascular training, swimming, stroke-development and leadership. The FAST Program is available to students who will be at least 13 years old (Grade 9+) at the start of the course. Students should have functionally proficient strokes. 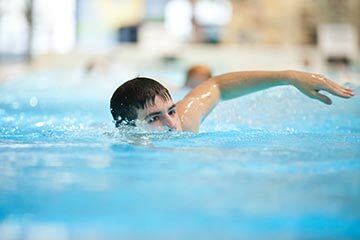 The program can support a maximum of 24 participants and students will be selected based on a combination of their grade, application date, and swimming ability. Providing equal access to this program for students of both genders from all three high schools is a priority. The FAST Program is offered entirely out of the West Vancouver Aquatic Center. This program consists of aquatic components, physical training, and classroom sessions. The program operates on Tuesday and Thursday from 2:00 pm – 4:30 pm throughout the year. Students are registered in this program for both afternoon fixed block rotations. Public transportation is available to allow Rockridge students to depart during the lunch break and arrive on time for the start of the FAST program. Sentinel and West Vancouver Secondary School students are within walking distance of the aquatic center during their respective lunch breaks. 4 credits for Physical & Health Education 9-10 or Fitness & Conditioning 11-12 dependent on the student’s grade. 4 credits for Emergency Response Leadership 11. 2 credits for Lifesaving 11 (Awarded upon completion of Bronze Cross). Bronze Medallion, Bronze Cross, CPR-C, Standard First Aid. Students will have a facility pass that will grant them unlimited access to both the Gleneagles and West Vancouver Community Centers for the full length of the program. The program cost is $100-150/month for 10 months. The final participant cost is subject to the number of students enrolled. FAST program featured by Lifesaving Society – the licensing agency for lifeguards.